Deep-fried Mars bars are a Scottish delicacy, proudly served in fish and chip shops up and down the country. There are few things more delicious than gooey, melting chocolate, nougat and caramel encased in a crispy golden shell. Now you can make your own at home. 1. Chill the Mars bar in the refrigerator. 2. Mix together the flour, corn flour and bicarbonate of soda in the mixing bowl. 3. Add milk to the flour mixture until the batter becomes creamy. 4. Heat the oil in the saucepan or deep fryer. 5. Remove the Mars bar from the fridge and dispose of the wrapper. 6. Coat the Mars bar in batter until it is completely covered. 7. Carefully lower the coated Mars bar into the hot oil and fry until the coating is golden brown. 8. Remove the deep fried Mars bar from the oil and allow to cool on kitchen roll for several minutes. I think this will work with other choccy bars Suz...never know if ya don't try. Back onto topic...Can you carry your tags over to next year? Will they give you "credit" for them if you hand them back...(like maybe you will be guaranteed of tags in the draw next year)? Sorry 'bout that Suzy. Better luck next year. Hey, do like we do and hit the road. Run from State to State until we connect. No luck there Vince. 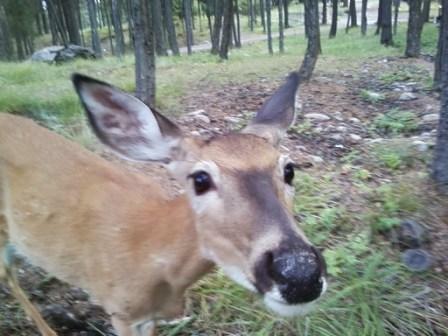 At the end of the season you are either eating venison or you are applying salt and pepper to your tag and eating it. Just found out I have until the 5th! Pays to read once in a while....I turned my calendar over to Nov. and I marked the calendar for hunting days. This Friday is my last day. I might get Thur. off too if I swing it right. Great stuff Suz...go get 'um mate. VINCE!!! can I carry my tags over to next year!! What a hoot! wish i could, that would be apples, eh what? No No NO it's like getting invited over for dinner, if you don't go you don't get dinner. I bought the tag, if I don't get the deer, tuff luck Charlie, try again next year. The tag fees pay for wildlife and habitat management, in harmony with ammo and firearms taxes sort of like gambling, the house always has the better end result in the long term. I'm watching the world series baseball game right now, there's a guy (pitching for the Texas Rangers) consistently pitching at 97 MPH (that's 156.1 KPH) The guys he's striking out are just left there shakin their head. OOOps San Francisco just won the game. Thanks for the deep fried candy bar thing, but I decided to take the candy to work and let those long legged, skinny 20+ yr olds have at it. They just about ate it all too. pizza is all ya need, they'll come right up to ya then.... whack 'em with a bat! Especially when they are half starved in the first place. Guarding the cave again tonight, Suz, while the ol' man sleeps? Still waiting for trick-or-treaters.....Hey Bushweed!! know anything about sturgeon fishing? I saw some guys carrying out a pair of nice lookin sturgeon around Harrisburg today. Didn't know they had any there. The regulations say you can fish the Willamette there year round. Years ago a man on the Willamette fishing for salmon hooked a very large sturgeon and a bow fisherman helped him get it in by shooting it with a fishing arrow. You guys are making me wanna go hunting now for some yummy critters....but, busted a bone in my foot enduro-riding Sunday on a hidden stump. Me 'n ol' pop were trolling in our 12' "tin-tanic" ( ) on the Columbia @ Lake Roosevelt next to the Colville mouth, I think it was back in 2003. Saw this bunch of fellers haul in a GIANT sturgeon. I thought it was a log untill we got closer. Biggest freshwater fish I've ever seen, by a giant margin. I'm not sure why but I think there are restrictions on them or weird size limits, can't remember but pop said better move on just in case. This thing was a giant. 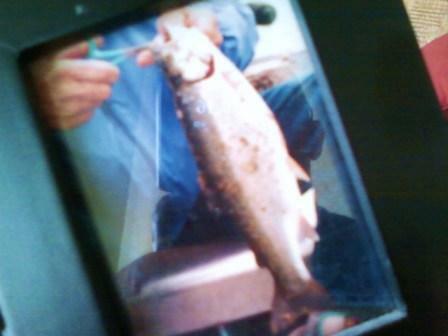 Took a pic of a pic from one of our jaunts in '02 near the Colville mouth. Good represnetavite of normal sized trout, with, some monsters coming up every so often. We ate like kings almost every trip. What a great place it was to fish with the old man. Can't remember for sure, but it seems that in Oregon a sturgeon had to be 6' to be a keeper.